In order to translate the physics of baseball into a Visual Memory Index, we gauged the air at each stadium venue using the "Neeley Scale" air density gauge, with all the variations of temperature and humidity. The gauge senses the barometric pressure caused by altitude, the temperature and the humidity and combines the three readings into one number to depict the air density. It is more useful to utilize a scale that is common to the mass population, so we put it on a zero to 100 scale with the heaviest air being closer to 100 and the lightest air being closer to zero. Why Gauge the Air? 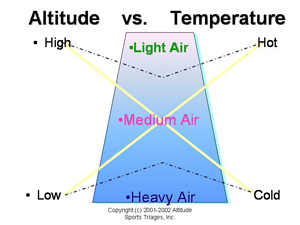 Many professional sports enthusiasts and players are well aware of the differences between the extremes of Colorado and Sea Level in terms of the weight of the air. However, few have considered all the increments in between sea level and high altitude and how it may be affecting competitive sports from high school through professional. Unless one can create a mathematical number from which to gauge, then there is nothing to include within mathematical statistical formulas and therefore no analysis. We have created that gauge in order to simplify the analysis. For example, we have created an era correction formula based on how much air resistance the pitcher was afforded in a particular game. Ultimately, we believe this will help in appropriate comparison of pitcher performance. Formulas - The formulas which drive the gauge are the traditional scientific formulas for air density calculation converted to the 100 scale. For the NeeleyAir air density gauge by Air Resistance Technologies, Inc. the formulas are populated by electronic sensors as opposed to calculation entries. This enables readings to be taken throughout a contest, downloaded into statistical data and analysis generated. Differing Geographical Venues - In professional baseball, Denver ranks the lowest in air weight at between 36 and 47 on the "Neeley Scale", with the venues at Phoenix, Kansas City, Atlanta and Arlington ranging between 54 and 62. Sea level venues range between 63 and 75 on the scale for those cities who have professional baseball teams. 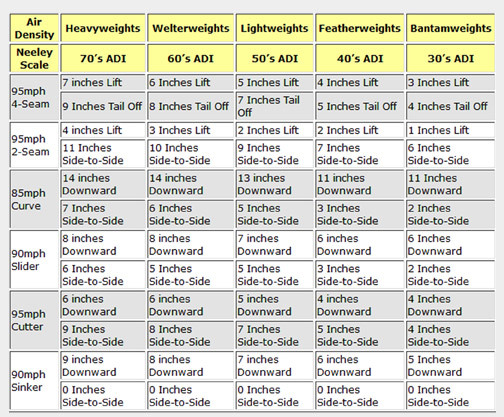 The scale leaves room at the lower end of the light air spectrum for very high altitudes and hot temperatures, as well as room on the heavier air weight end of the spectrum for gauging sea level locations in extremely cold conditions. This was desired for additional sports and for future uses of the gauge.